Action on the waves, energy on your body and fun in the summer takes place in this article. Surfer Crossing! 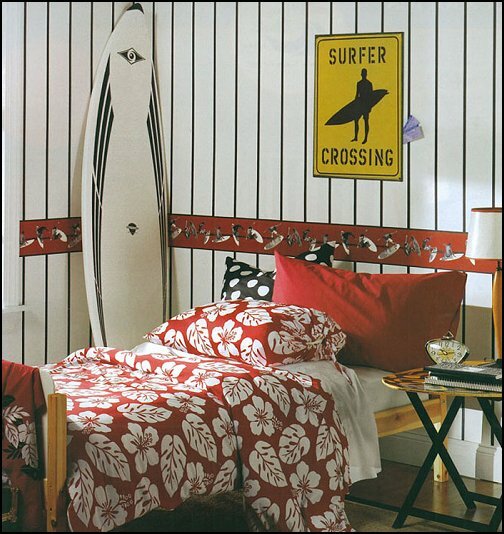 Surfer Boy Bedroom Ideas. I think, another rich taste of water and ocean is ready to be demonstrated. In Surfer Boy Bedroom Ideas, color selection is a piece of cake. Any color your little boy likes can be applied to the room. Fabric choice can be floral printed or any surf related printed, striped, plaid or plain. In this article you will have fewer subjects than the other ocean related themes. The surfboard, waves and surfer boy are good to go together. Some Hawaiian style can be added. As a decoration you can use any framless picture and figurines. I will be very pleased if you can add more pictures about Surfer Boy Bedroom Ideas. Picture Credit: Jodie Cooper Design via Houzz. Very nice matching wall mural, bedding and surfboard. Simple and elegant. The contrast between the flooring and decoration helps to pop up the ocean colors. Blinds color gives the contrast too . Love it as a whole piece. Picture credit: 1. bp. blogspot. The most loving part of the room is the black and white striped wall paper and surfer boy wall border. Black, white and red are coordinated well and also matches with the surfboard. Surfer sign is such a good idea to emphasize the theme. Aloha bedding and foldable tray nightstand give the fresh looking at the first sight. Picture Credit: Pottery Barn Kids. Lovely bedding with the surfboards match with rug. Panel bed and nightstand are the same color as dark chestnut. Neutral color wall arts and rattan toy chest are stylish. Navy blue flat panel curtain is plus. Two thumbs up.The mural at the ceiling is very meaningful. Surf around the world! Did you find out little figurine in front of the window? Picture credit: 2.bp.blogspot. 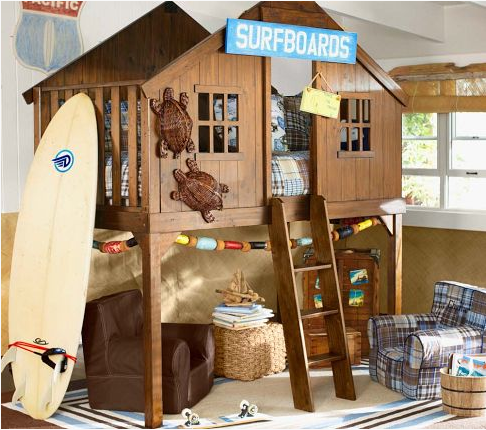 If my little boy has a loft bed like a beach house style and the sea turtles walk through the house , surfboard is accessible, he cheers and he is ready to frolic. Hats off design. Please wait for my upcoming article written for a beach boy.